Milot Rashica scored twice against FC Augsburg (Photo: nordphoto). Werder didn’t miss many of the chances they had against Augsburg. From five shots in the first half, the Green-Whites turned three into goals and had Jiri Pavlenka to thank at the other end of the pitch. “It was a bit lucky,” said Maximilian Eggestein after the game. Werder saw the game out well in the second half: “That was really intelligent,” said Florian Kohfeldt. 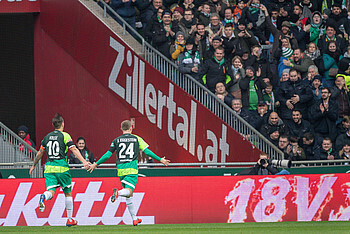 Kevin Möhwald made it 4-0 to Werder (Photo: nordphoto). Johannes Eggestein: "It wasn't as easy as it looked in the end, but it was really nice to give something back to the fans on a day like this. We played well and deserved to win." 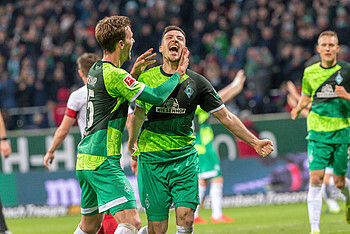 Johannes Eggestein scored his third Bundesliga goal of the season (Photo: nordphoto).